I captured this photo near Pelmadulla in Sabaragamuwa Province. I always enlarge your pictures since they are always so good. Love seeing those mountains in the background. AND--I cannot get over how green and lush and beautiful everything is. We are just coming out of a dark, brownish, dull winter. I'm SO ready for more green here!!! A lil green paradise. That must be a watch hut in the middle of the pic. If not they're the luckiest to be living amidst so much greenery. Is that row of trees meant to divide the land? gorgeous mountains. the abandoned building adds such character to the background as well. but, then i'm partial to abandoned sites. hope all is well. have a great day. The little hut looks so nice to appear in the picture. This is a beautiful scene, especially when it's enlarged. The grass is lush, fresh green. Sabaragamuwa province is beautiful. I've been to some crystal clear streams in Rathnapura,Bopath falls in Kuruwita, awesome! Thanks for visiting and commenting on my blog too. Some photos are even more detailed but I scale them down before uploading. Hope the coming spring will bring similar green to Tennessee! It looked like a watch hut, an abandoned one may be. Nice to see you after some time! It can well be a boundary. 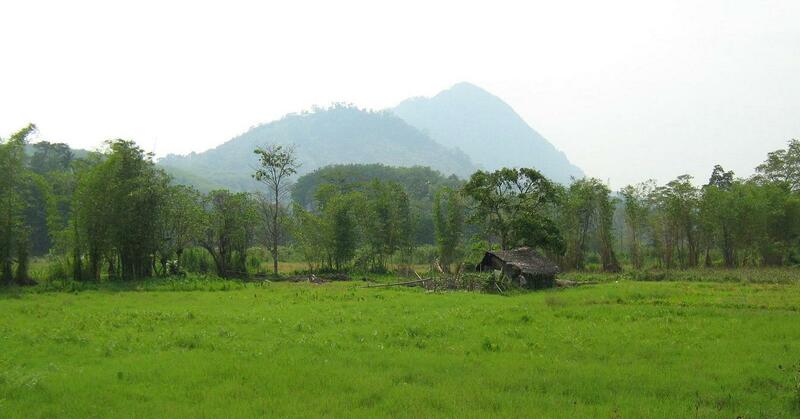 The front potion is a paddy field, an abandoned one. There are boundaries between two fields and usually those are narrow paths, but this one looks wider and there are tall trees. Yes the small cadjan hut adds some character to the view. Thanks for dropping by! It is hard to find greener country than here! Yes, it surely does!Glad you like the image! You are welcome. Yes, Sabaragamuwa is an amazing area for hiking. It has most number of waterfalls in SL. Yes, it is a small hut. Could not see whether any one living there or not. Most probably a temporary hut. like the others, the hut added character to the place, would be nice to spend a day or two in there. Thanks Chavie! Are you back on line? the green color is just so beautifully green..
That is a change! Otherwise, I was about to propose a much better provider ha.ha.. Thanks for the input. I can't exactly say the place. 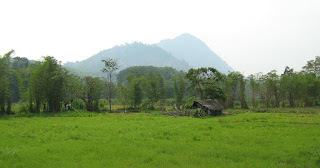 But I remember I turned towards Rathnapura at Pelmadulla coming from Udawalawe and after travel ling a short distance saw this beautiful sight.